The new opening of the splendid new theatre Cast, is the latest iteration of drama on this site. It dates back to 1921 when it was first opened as a sports hall and then turned into a theatre by architect Edgar Wilburn in 1922. From this point it was owned by the pantomime star, theatrical producer and comedian Harry Russell and run with his Newcastle-born wife and former Tiller-girl Madge Allan. 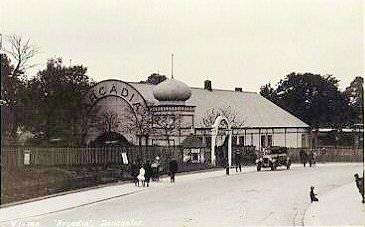 It was originally called 'The New Arcadia' and Russell renamed it the 'Arcadia Picture House' in the early 1930s. Note the barrel roof which was retained through to 2013! In the late 1940s Doncaster Council purchased the building and converted it to a theatre and cinema as 'Doncaster Arts Centre' - one of the first such municipal facilities in the country. Following major refurbishment in the 1970s the Doncaster Civic Theatre was born. Since then this 495 seat, single story proscenium auditorium has been the mainstay of arts activity in Doncaster, attracting over 70,000 visits a year to a varied and lively entertainments programme. The venue's programme is a mix of professional entertainment and artistic product alongside a thriving local amateur scene and an extremely successful annual pantomime production. It was locally famous for it's long-running (since 1978) star-studded pantomime's, in keeping with it's original owners love for the form. Ken Dodd, Duncan Norvelle, Louis Emerick have starred! May 2013 it closed and was rebuilt through the Summer to be relaunched in September 2013 as the Cast Theatre.